And the club’s former director Ian Croad, who left the boardroom to focus on his recovery from illness, has also made an unexpected return in a new role as football manager. Tangata left the Shay at the end of 2018 to take up a full time contract with Widnes, but that move turned into a nightmare after a chest injury and the Vikings’ financial collapse ended with him being made redundant. Coach Richard Marshall offered the Cook Islander the use of Fax’s facilities to help with his rehabilitation and the player, who would need to apply for a new visa before he can resume his career, has been a regular sight at matches in recent weeks. Fax’s supporters’ group, Fax1, have been pushing their Squadbuilder fund in recent days, with Tangata the obvious target. 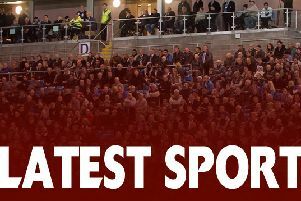 Bradford, who visit the Shay on Friday (3.0), have reportedly already offered the 28 year old prop or back rower a contract, while Wigan, whose title defence has been faltering at best under new boss Adrian Lam, have also shown interest. But Croad, who said the focus of his own return was to “assist the board and take some pressure off the club’s coaching staff” ahead of the usual summer contract merry-go-round, is upbeat a deal can be done. “We just need a little bit more money to get it over the line,” he said.